Worddddd. Back when I played sp I would just get bored after I had everything I needed to survive :p.
I also have a 4 year old survival world that I still regularly work in. It's really cool seeing all that you've accomplished. I also have had to deal with similar things as you, particularly having to travel real far to get certain resources. I still haven't found a mesa biome yet. I've got a rail line I've made that takes more than 5 minutes to ride to the end of it. keep up the good stuff. When it becomes available it will most likely be upon request, and not for server use. Thanks! Have you got a got a thread for your world? I'd love to see it, or message me it. I'd love to see what another person has done with their long-term world. No re-design just a bit of an alteration. 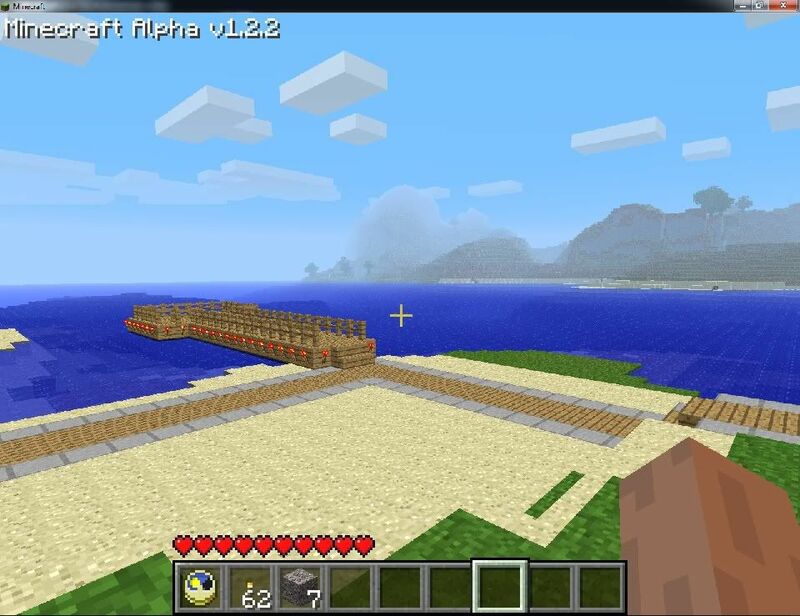 I have just finished moving the dock by rebuilding it on the big stretch of beach past the bamboo reeds, just before the main watch tower and after the home-made lava beacon on the grassy bank. With the curved dock ports near the shore, I think it actually looks like a scorpion shape on the map! Not something I planned! Originally I was going to re-design it, still in nether brick, then it was going to be like a walkway in a nether fortress, it's been on my mind for a very long time. I was going to forget the use of nether and just re-design it or get rid it and not replace it, so here's the thing. Before moving the docks I had decided to remove it and not replace it, but maybe build a ferry port. (For the journey across the ocean to the other side.) After moving the doc however, (I love it being where it is now! ), there seems little point building a ferry terminal when the dock is right there, so I'm getting rid of it once and for all, it just doesn't fit in any more. I may however work across the ocean where it ends, and sort out that chunk wall once and for all as well, or at least try and make it look more natural. The little dock with a seating area. The last thing that has hardly changed much at all over 4 years. My first idea was to make it longer and have a little diner on it, but again that's to "public way/use" as opposed to being part of my private residential property. So I typed "Dock diner" and "Diner on a dock" and got some strange and interesting results on Google Images, but nothing grabbed me. I wanna do that! A higher raised area, but not square, my immediate thoughts were hexagonal or maybe even octagonal! Okay, maybe not octagonal, as it would be huge! Circular? Which do you think? It's gonna change the feel of that area quite a bit! 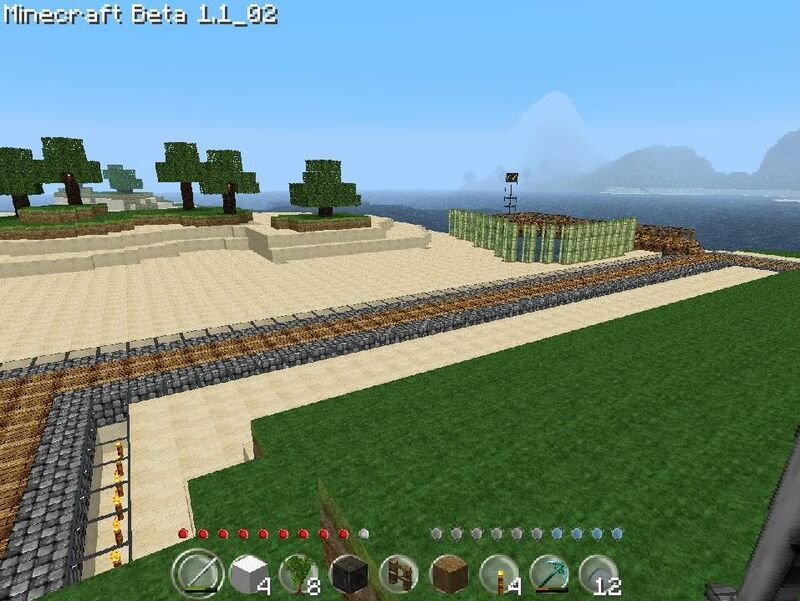 in 1.8 I WILL make a cool world!! Very cool. Props to you for keeping a SP world going that long! You say 2014 exists, so you no loner have the 2012 & 2013 ones? As I've never released a world before, does anyone know if I should omit the playerdata & players files from the save? I don't want to compromise anything. So the day has come, the final last two landmarks have reached they're expiry dates. 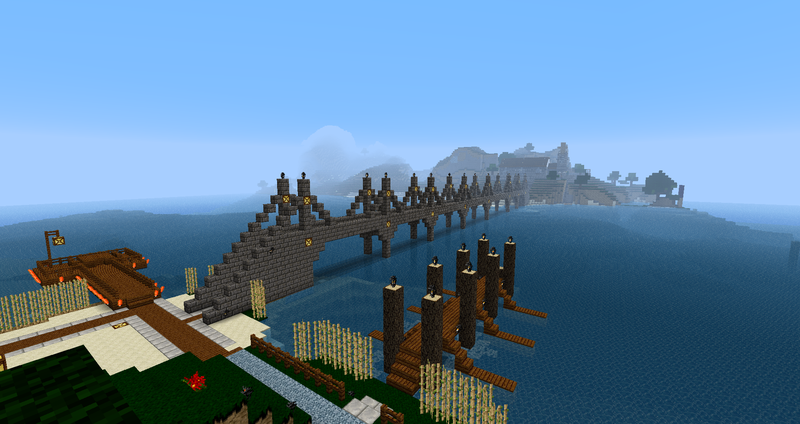 As I mentioned before, the nether-bridge no longer fits in with the world any more and had to go. The whole "pouring water on it" to extinguish the flames however didn't go according to plan, in that it didn't go in the side crevices, so it was just easier to mine it down. All that is currently left is the main walkway and the stairs leading up it either end. Should've used optifine's zoom for this pic really.. Just beyond the old watch tower it's almost gone! Although I've not mentioned it, the pool area was out of action for the last few days as I make a small structural change. For a long while now I've been thinking of changing the diving ladder as it's easy to fall off the current one, I shall build a nice new modern one. To do this however I need more space - go look at the above picture again! You may not have noticed because of the distracting temporary dirt wall, but the left mosaic wall with the patter has actually seamlessly moved back 3 - 4 blocks! It wasn't too much of a hassle, and it meant I also had to end the last of the cobble fort wall differently to the way it connected to that wall. As soon as I started I encountered a problem though, and that;'s exposing the redstone for the automatic door in the fort wall - so I had to re-do that all again and think of new ways to hide it. Due to mobs, I've also added a bit more glowstone on the pattern around the walls of the pool so it's a bit lighter and less of an invitation for creepy crawlies at night. Ditto with the tennis court - an extra block of glowstone under the carpet at either end where the fence "net" is. All the way up to mid-2013 where I stopped using the pooh color for oak planks and went back to normal pretty much all they way up until now in February 2015. This is a planned build, in that I did a test build on my creative copy of the world, however, that one was a bit wonky and less measured out - built on the fly. The actual one I'm building in the actual survival world is in fact a bit better as it's actually symmetrical. I went for the octogon in the end! The first glowstone had to go underneath the dock, sub-merged underwater due to all the mobs that kept coming around the place, hence the little pool of light underneath in one night shot above. There was also a near-death situation nearby when I got on Flash - my donkey to get supplies and saw a creeper come towards me, very closely! I didn't even have time to get off as I flailed and tried, just enough time to back Flash up and he just survived. I was very lucky not to loose him! You'll see the log supports underneath are on concrete (Stone) supports that get all mossy and covered in algae (Vines) the further down into the water it goes. Pity there isn't algae in Minecraft.. May add lily pads later. Still some finishing details to do but it's almost done! Also something funny happened. The top of the roof now has a glass skylight to look up at the stars using light gray stained glass, but to get that not only did I need to get the ink sacs, but at night - bones from skeletons for the bonemeal. 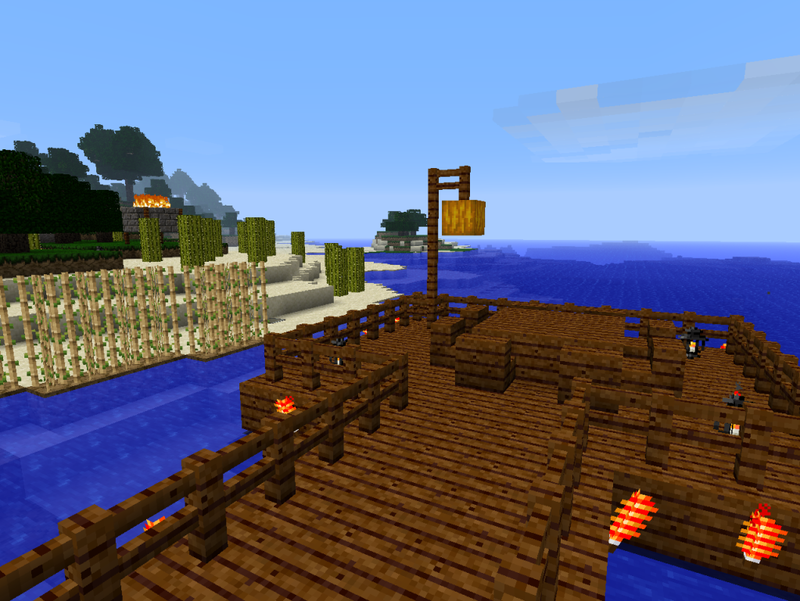 I wandered further back on the shore past the newly re-built dock but wasn't getting any skeletons. I wondered right over to the edge of lawn near the bottom of the apartment block, but here's the thing, in irl; my computer desk is by the window so I didn't see the creeper as the sun got in my eye! I'm leaving it there in the wall and will add a sigh later! I've rebuilt the rest of the hole back up, but I'm leaving that one up on the side of the wall! Speaking of that cobble wall by the pool, I've one last wall to "Fix". I shall do that too. All the others I HD--ified in that they went from one block walls to 3 block width walls for depth, one wall remains that needs changing, and it's on the outside, also involves the inside of the private garden are, which will have to loose 1 bench by the current wall with the window to HD that wall and match the rest and have it all connect up better. Comments and thoughts welcome as always. must be hard mob proofing your base. If I was living in it I would feel too cautious of my surroundings. Just one creeper and I will run the hell away from it. Recently, you've been doing rehabilitation of your builds and in the process, you demolish the old structure so that it could be replaced. You must have a lot of patience doing that, I'm impressed. Lastly, If I was in your position, I'd burn the structure instead of chopping it down. I don't know but breaking blocks manually is just laborious. That's awesome man! Keep up the great work. I suppose I could've burnt it down but you never know when you might need the wood! That said I have tonnes admittedly - and the tree farms. I dunno, may it would've felt to sacrificial to burn it down! I don't think I'd have the heart to do it! Can you give a world download? If you like super cool Minecraft animations, go to my channel! Please leave a like or subscribe! Thank-you sirror99. yes that is a big concern as it's not just a casual build but my main home that I've worked hard on for 4+ years. There's some other stuff I couldn't include in the last post as it was already a massive post as it was. Yesterday, I went back to the red mesa for more red sand (= red sandstone = red sandstone stairs) for the the recently rebuilt church roof and finished it off - almost. Still need a bit more for the join at the very top between the two sides, But I've sealed that row up with cobble for now just so the roof is sealed. Quite dark at the top inside now. Slowly starting to look more like a church inside as the grass floor is reduced to just the front near the altar. Just this morning, I've had another idea! I've just decided (Before this post) that I want a better entrance to Mount DOOOOoooom rather than just the side piston entrance. Don't worry I'll keep the side entrance for donkeys and horses, But I want a much more grander entrance. So I'm off to do the new entrance now! also i have a question what texture pack do u use? I applaud the ability to stick with your alpha world. I still have mine, and it was really tough to leave it, but after so many terrain generation changes and the biomes getting messed up (which made my weather and tree leaves mixed up) I just couldn't stand it any more. I believe that the octagonal dock that you have built is more like a gazebo (Although a gazebo is more likely placed in a garden/ backyard). Just some info.